I can do 6 gallon batches with this setup. However, if I had a bigger brew pot I could do 10 gallon batches as the cooler can actually hold up to 12 gallons for mashing and laudering. What I do (actually, what I did, I've only brewed one AG batch so far): Heat strike water in pot. Pour strike water and grains into mash tun. While mashing heat sparge water up in pot. Sparge and drain back into pot. Boil in pot. Transfer to fermenter. I bought a 8 cup pyrex measuring cup, the biggest I could find, to transfer the water from the pot to the tun for mashing and laudering as well as from the pot after the boil to the fermenter(sanitized the measuring cup of course for this step). 1. Turkey fryer and pot - Had this for the past 10 years, so I don't know how much it would cost. $70? 4. Wort chiller - Approx. $75 for copper tubing(refridgeration tubing from Home Depot) and hose adaptor and plastic tubing. You might not even need all of this equipment, so it might be cheaper for you. All I have to say is I noticed a big difference in the wort instantly doing all grain compared to extract. Much tastier! But for now, this is a good easy to build start. You could probably put everything together in about an hour or so. So simple, even that dog can do it! Here's hoping for the turkey fryer for my bday coming up! Great post. Sixstring, your mash tun looks very familiar! Canuck wrote: Sixstring, your mash tun looks very familiar! What am I missing here? Did you guys remove the inner plastic part of the hose? 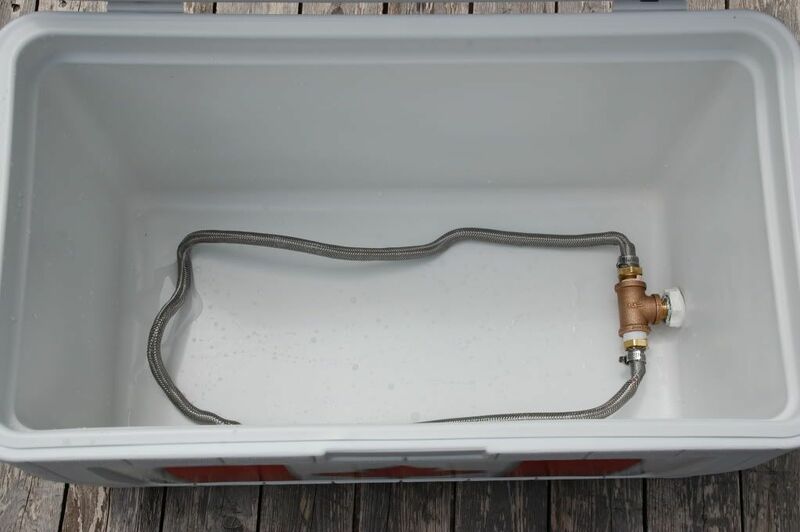 Is there a link on how to build this type of mash tun? Yes, the inner hose is removed so the wort can exit out the mesh and into your BK. Yep, like Brent mentioned, the plastic tube was removed. Coiled 16 gauge wire was inserted into the hose for rigidity. Take a look at his video, it's basically what I followed to make my mash tun. There is a YouTube link in my post under item #3. The video will show you how to do everything. Most likely the same video that Canuck linked to. 1) How deep does the grain bed end up being, assuming a normal-sized batch (10-15lbs grain)? 2) Do people batch or continually sparge (I've never tried batch sparging, but was thinking of giving it a go)? 3) Does anyone know what the thermal mass of a system like this is - my brewing software wants to know?